When my husband and I decided to build a new home, I searched for the perfect designer. I was blessed to find Cynthia. Cynthia simply gets it. She knew what would suit our style and family best, and has created a space that is not only beautiful, but is us. She helped at every stage, from the floor plan design to the tea towels now beautifying our kitchen. We have young children, and I so appreciate that Cynthia was able to source beautiful finishes and furniture that were also child friendly. We were so happy to have so many Canadian, locally sourced pieces as part of the project. You should see the cabinetry- there are no words! Not to mention the gorgeous artwork by her late uncle, Peter Etril Snyder, which has brought Canadian landscapes into so many parts of our home. I highly recommend Cynthia. Thanks Cynthia, and Kent & Spencer! We recently bought a new build with an open concept great room. Beautiful but overwhelming. Cynthia spent a great deal of time (and patience) helping me identify my style and vision. I was full of anxiety and lost sleep worrying how draperies, furnishings, carpet and colour would work. As each piece arrived the room came together with style, comfort and the “wow factor” we wanted to achieve. I love it! Cynthia’s eye for colour and quality is flawless. Thank you, thank you, thank you. We undertook a large scale renovation of a 40 year old home including a full redesign of the main floor and master bedroom/ensuite. Design is not a strong suit of mine so I began researching designers and loved Cynthia’s work. Working with Cynthia on this project was one of the best decisions we made. We felt Cynthia was superb in all aspects. First and foremost, she is incredibly knowledgable about design and was able to come up with a beautiful layout and colour scheme based on a few sentiments And pictures I shared with her. She nailed it right away. Cynthia was also sensitive to budget and our environmental preferences and helped us find some fabulous locally made pieces of furniture. She worked within our budget to get high quality products. Cynthia was by far one of the most professional trades people we worked with on the reno. All of her own work was completed on time and as promised. When contractors or other suppliers were delayed, Cynthia was flexible and accommodating whenever possible. We asked Cynthia to join us when visiting our kitchen supplier and she worked wonderfully with the in house designer. In fact, the in house designer later complimented us for working with Cynthia. The few times we felt dissatisfied with a product, she dealt with it immediately and rectified the issue (some cases a return and in others a quick lesson on how to use the product correctly). Our house is wonderful and we are so appreciative of Cynthia and her beautiful work. Highly recommend Cynthia Weber Designs! I have been working with Cynthia for a couple years on a large fieldstone farmhouse renovation project. On a personal note- Cynthia and Kent have become like family and I will very much miss working with them. Though, I’m happy to report they still stop by from time to time when touring by our farm. We were very pleased with the service and results of Cynthia Weber Design in the major renovation of our cottage. Cynthia transformed our 1960’s vintage cottage decor into a modern up to date open concept design. She provided the professional advise that we required to move confidently forward with this project. We would certainly recommend Cynthia to anyone thinking of undertaking similar renovations. We were extremely pleased with the results and look forward to enjoying our new and updated cottage. Cynthia is exceptional…her ability to capture the essence of your personal style, and raise it to a whole new level, is second to none. She visualizes the subtle details that will take a project from special to spectacular…while maintaining a high level of respect for the budget. She’s truly a rare find! My experience with Cynthia was excellent, from the initial design to installation. Her design suggestions were thoughtful and reflective of my needs and personality. I finally have a warm and welcoming living space to share with close friends and family. I love the style, fabric and comfort of all the pieces, her ideas have transformed my home and I love it! I needed professional help with curtains and fabrics. vague vision come to life in my home! I would highly recommend her services! We hired Cynthia to oversee the redesign and renovation of our open-concept kitchen, dining room, living room and entryway. She worked within our budget and existing pieces, adding custom furniture, draperies, designer lighting, and a fresh modern direction for our countertops, backsplash and hardware. We entrusted Cynthia to select artwork and style pieces. Everything was delivered within budget and ahead of schedule. She is professional, talented, and we would highly recommend her! We recently purchased a cottage property on Lake Huron, and quickly found ourselves ‘frozen’ in terms of where to start with paint colours, furniture, and overall design. We had some ideas of what we wanted the final look and feel to be like, but needed some help in order to get started. 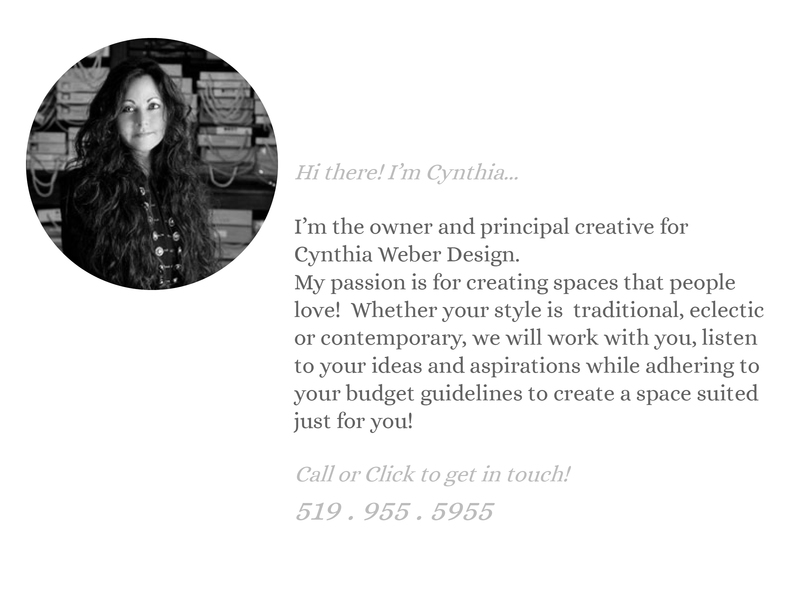 Being new to the area and not really having any contacts, I decided to poke around a bit online, and came across Cynthia’s website, so I decided to give her a call. Right away I knew she would be able to help, and didn’t feel intimidated in the least. We met with Cynthia at the cottage. She was extremely professional, confident, and obviously well experienced, but she also listened to our ideas and freely offered opinions which where much appreciated. We now have a game plan, and the confidence to move ahead. Excellent value, and money well spent as far as we’re concerned. My husband I spent Mother’s Day at the Little Inn in Bayfield, Ontario.. We were impressed with the recent renovations done to the Inn and inquired about the Designer. We were given Cynthia’s name and contact info. We were looking to update our home and Cynthia met with us and offered several suggestions. We took them all! We updated our kitchen island with a beautiful butcher block countertop, we added new window coverings, stools, pillows, stair runner – all beautifully coordinated. We had a bench and mirror made for our front hall and a live edge bar. The furniture and countertop were pieces of art – beautifully made. The cost was entirely reasonable and we met our budget. Cynthia was timely, professional and creative. Thank you! We are loving entertaining in our updated space. “When we embarked on the extensive renovation for the Little Inn, we knew there was only one design team who could fulfill our vision for this very large renovation and restoration project. We asked Cynthia to create a design concept that would be fitting to the history and stature of the Inn. What she came up with spoke to us right from the beginning. Her suggestions throughout the process from using local craftsman to layering in unique imported elements all added dimension and interest to the design. She has helped us transformThe Little Inn of Bayfield into a perfect setting for our guests to relax and be pampered. Whether a dinner with friends, a romantic weekend away or a wedding, we know the memories made here will be as beautiful as the surroundings now are. Cynthia Weber is like a magic prism through which one’s dreams of a perfect home can come true. Unlike some designers who bring the same set of ideas to each project, Cynthia listened intently and openly to our wishes and preferences, and then, when she really understood what we were trying to accomplish — without having any idea how to achieve those goals ourselves — she employed her extremely impressive combination of imagination, creativity, and (to us) jaw-dropping sourcing capabilities to bring our dreams to fruition. She works tirelessly to make sure clients are satisfied, and is brilliant at suggesting ideas, large and small, that turn every unformed client desire into 3-D reality. My wife and I were amazed at Cynthia’s uncompromising quality, speed, reliability, meticulousness, creativity, resourcefulness, and kindness. Not only is our home a far, far sweeter place than we ever could have achieved without her, but Cynthia’s overall aesthetic has extended to other parts of our lives as well. It’s fair to say our life is better in general having worked with and been inspired by Cynthia. Cynthia is so talented. She listened to what we wanted for our cottage, and made it even better than we had imagined. We went from owning a cottage stuck in the mid-eighties to one that was more contemporary, relaxed, and comfortable. Gone was the yellow and blue colour theme, the tired furniture, and dusty check curtains. In their place, was a bright, airy, refreshing colour theme (white and aqua green) with new furniture that was comfortable and inviting, and bedrooms that were comfortable and cottagey, without looking caught in a bad time warp. We, and everyone who visited us last summer, loved what she’s done to create our oasis on the water. We highly recommend Cynthia! Cynthia was referred to me by a friend to help me start a family room makeover I had been dreading. With so many styles of furniture out there I had no idea where to begin. Cynthia came over prepared with fabric swatches and listened when I was trying to explain the style I was looking for. Shortly after she helped me pin down a fabric for my new sofa and love seat. The rest is history and has come together beautifully. She is always there via text to help me with an accessory choice and even helped my daughter piece some decor together for her room in university. I would have to say a new friendship has formed and I look forward to her helping me with more projects down the road. I found Cynthia’s name on the web. I liked the design of her website, spoke with her and we haven’t looked back. She has been tremendously helpful in helping my husband and me transform our lakeside cottage into a wonderfully comfortable, well designed haven. She and I chose a piece of material with navy, light taupe, citron yellow and deep aqua from which all the colours for the furniture and paint were drawn. The cottage has a sophisticated nautical sensibility. The three bedrooms are wonderfully restful. We didn’t change the small footprint of the cottage but is feels transformed with light and wonderful views which were heretofore obscured.